CEH has produced four digital land cover maps in 1990, 2000, 2007 and 2015. Each of the land cover maps are available as a number of different products with varying spatial resolutions. All of the products can be obtained from CEH under licence for academic, non-commercial and commercial use. CEH encourages use of land cover map data for academic research and education. All CEH land cover mapping is available under licence and free of charge to academics and students for use on specific, named, non-commercial research projects (administration and handling fees may apply). Most products are free of charge for non-commercial use, although a few may require the payment of a licence fee. LCM2015 is distributed in a range of data formats and at a range of thematic and spatial resolutions to supports the diverse range of applications. The vector dataset is the most detailed of the LCM2015 data products. The vector data product is provided as polygons with each polygon having associated attribute data; these include its area, source images, Broad Habitat, and processing details. It is a large dataset and may prove unwieldy for some users. The 25m raster dataset is derived from the vector dataset and shows the dominant land cover based on a grid with a 25m resolution. The 25m raster dataset provides a similar level of detail to the vector dataset but without the additional attribute data and polygon boundaries. 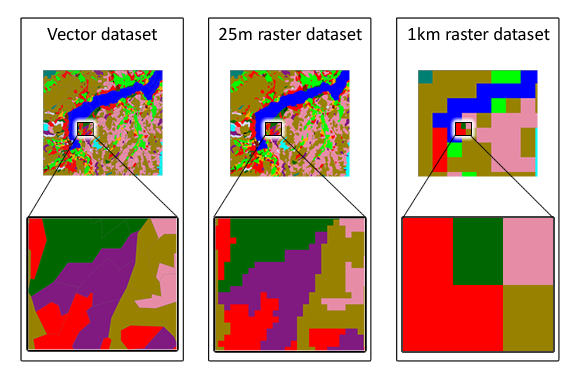 The 1km raster datasets are derived from the 25m raster data and are at a much reduced resolution. They are typically more appropriate for applications modelling the whole of the UK and are often combined with additional data, such as meteorological data or species distribution data. This is broadly similar but uses a set of 10 aggregate classes based on merging LCM2015's 21 classes as not all applications need the thematic resolution of the complete set of classes. LCM2015 datasets are available from the Environmental Information Data Centre (EIDC). All LCM2015 products have individual DOIs, so you can cite the data in the same way that you cite other sources of information, such as journal articles.